I went on a business trip and took the Red Stapler with me because I knew I would be meeting up with some bloggers and I thought it would be great to get some photos. The following Monday, we found that we were in danger of being laid off. 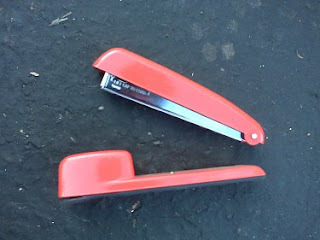 I started this blog and got the stapler when I first started that job. How could I leave that grim & depressing post up for so long? My apologies. My excuse is that I have been BUSY - I think I have done seven news articles in the past five days PLUS job hunting. Ok, a bullet point post will have to do. I'm not going to say much but cross your fingers for my job hopes. There may be something good around the corner. Things with the folks are even MORE worrisome. I'm pondering next steps. I wish my siblings all lived in my town so we could sit down over coffee, because they are all smarter than me. I have done exactly nothing for Christmas so far. My ex-job supplied me with 2 months of career search services, which I very much appreciate. That is mighty decent of them. There is something to be said for working for a SuperMegaHuge Giant Corporation. Any advice on whether to buy Quark or InDesign if I want to do some design work again? I have Illustrator and PhotoShop. I worked in Quark 40 hours a week for, oh, a billion years, so I am more familiar. What are all the cool kids using? Ok, off to do more reporting. Mo' money, baby.